It's a rainy Saturday on the West Coast. It's a perfect day to spend stamping. Today I have my Holiday Card class and I'm excited to make some cards for Christmas. I've just posted my new classes for November. Cost $35 for 4 cards with envelopes and a 3D item. Register for the Many Merry Stars Class at the same time and the cost for the Card Class is $25. Bring a friend (new to me) and the cost of this class is $25. If you also order the kit in advance of the class - the cost for the class is $15. 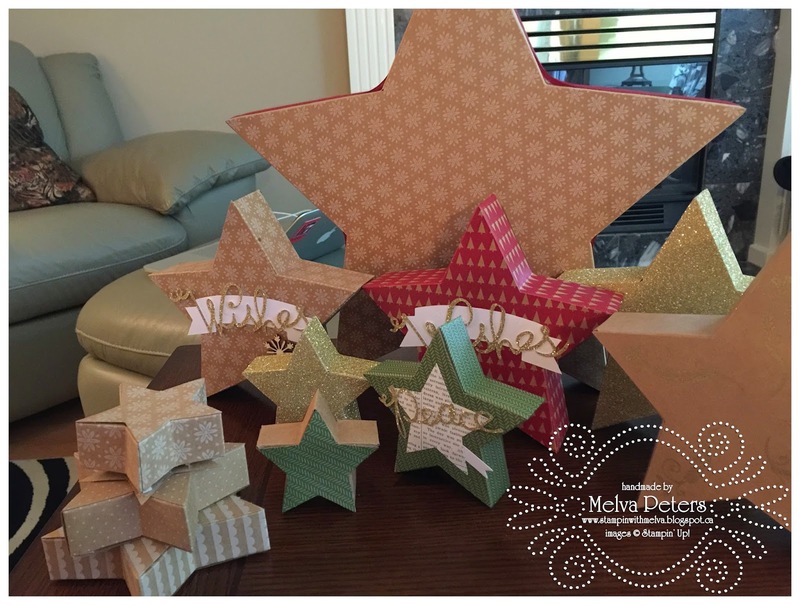 I'm so excited about the Many Merry Stars Class - I spent yesterday putting together some of the stars that come in the Many Merry Stars kit from Stampin' Up! It was so much fun. Check out some of the stars I made. These stars will look great once I get my house decorated for Christmas - it's way too early to start thinking about that! I can't wait to show everyone these stars and some other ideas for using them. If you're interested in signing up for my class on November 11th, click here.